Some people think my experiment in ecosystem gardening is on the verge of getting out of hand. First it was coyotes on the lawn, bears at the feeder. Pretty soon the house will become the fields and the woods. Heck, I’ve already brought in grapevines, grasses, and wildflowers to decorate the spaces. Next I’ll be inviting the animals in. Oops—apparently that’s what the wildlife are thinking, too. These almost seventy acres are known around here as pretty worthless farmland–for many decades, young heifers were put out here to pasture occasionally, but that’s about it. We’ve got ledge outcrops and an old quarry, swampy sections and copses threatening to turn entire fields into entanglements of buckthorn. We love it. The neighboring farmer scratches his head in wonderment over our delight in this scruffy overgrown spot. But it’s perfect for practicing ecological gardening and wildlife habitat and corridor restoration. 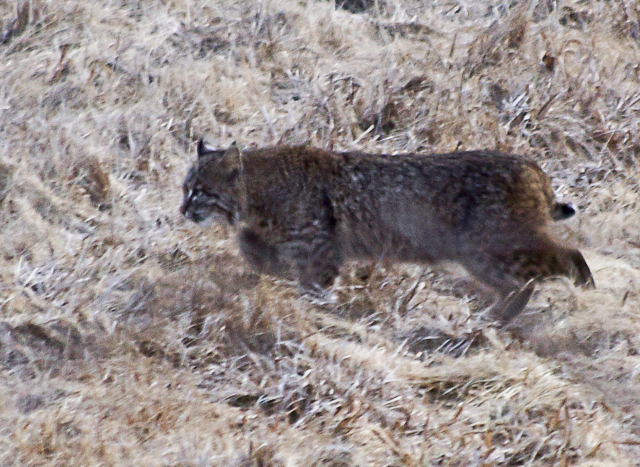 Bobcats, fox, coyotes and raptors keep the rabbits and rodent populations in check. The ponds teem with muskrat, turtles, snakes and the odd beaver plus migrating ducks. A black bear wandered in last year. Plenty of deer, field birds, songbirds and wild turkeys. Ermine and even an opossum that fell asleep on a bale of hay in our barn. Butterflies and bees and insects massing at the wildflowers. Short of throwing out the wildlife, how is it possible to weave an orchard , a nut grove, berry rows and extensive vegetable gardens through this parade of wildlife? I choose varieties of plants that support the wildlife as well as the humans. I make sure almost all the vegetables and herbs–at least some of each crop–go to flower for the bees–our ace pollinators, and to seed for the birds and critters as well. I do not forage for wild foods–I leave the wild apples, pears, berries, herbs and greens to them–way out in the fields. I can grow my own, close to the house. And I plant knowing who is likely to make inroads on what. Sure, the rabbits take off the carrot tops near the end of summer–but that’s okay, I could throw the greens into the juicer, but usually they go into the compost. All I really want are the lovely roots; all the rabbits want are the tops. Brilliant partnership–everything is eaten. We can share. Okay, okay, if left unchecked rabbits also mow certain, non-root crops, down to the ground. The first season trying out a crop new to me, especially something green and tender, I know I’m taking my chances with the bunnies and deer and insects. I always lose something. Last year it was fenugreek–in a single night, of course the night before I was going to pick it. Who knew that rabbits would develop a passion for something they had never before encountered? It must be their ice cream, their chocolate, their food fantasy. 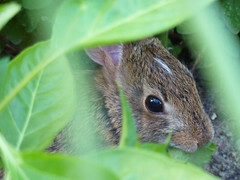 So, I’ll plant it with the lettuces and the chard this coming spring, inside rings of mint which rabbits loathe (read my article on growing mint for more information). Or maybe I’ll make a little netting fence to keep them out. And as for the deer nibbling the kale and Brussel sprouts, the young raspberry canes, the bud ends of young fruits trees, I’ll also be fencing these areas in with a bit of netting during the vulnerable periods. It’s interesting to watch the wildlife becoming quite comfortable around the place. Cheeky, even. 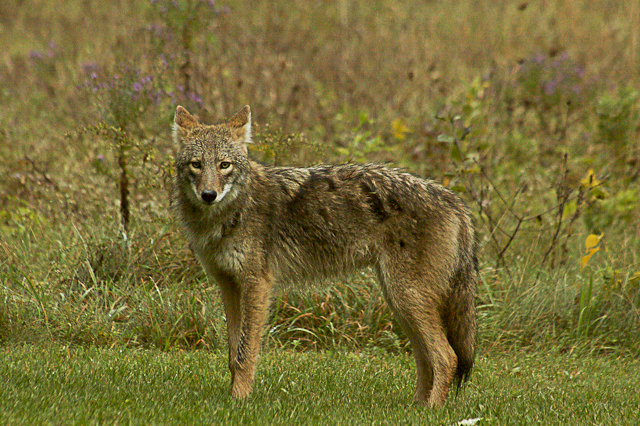 The coyote, the bobcat, the owl, the hawks, the snakes all keep tabs on the voles and mice and rabbits that frequent the garden beds. They watch me carefully, stay out of my way, but let me know they’re about. The deer–much shyer than in many places, probably due to our hunting season–haven’t been a big problem close to the house though the wild turkeys find their way to the bird feeders on a daily basis during hard winters. And all that’s okay by me–it’s as it should be: they adapt to my encroachment and I adapt to theirs. They stay as wild as they can considering the proximity of humans, and I give them a wide berth. I do not try to interact with them except through the plantings. This isn’t becoming a petting farm. I don’t need or want a tidy garden. I want an effective garden that belongs in this landscape, this ecosystem. All the inhabitants play a crucial role in the health of this place, of this planet. But this winter, things got a little out of hand, I’ve got to say. Not only do the wildlife make their way through the fields and gardens, now some of them are making their way through the house! I expect bees and bats to find their way in by mistake, and mice and mosquitoes, not by mistake–but an ermine?! Yup, that’s right. 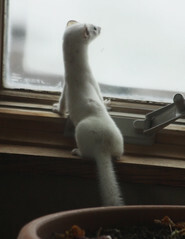 An ermine got into the house, presumably chasing a mouse, and I found him calming looking out the window. He left calmly, too, when I opened the door, without waking the two cats which were asleep on nearby chairs. It’s a partnered dance, really, and sometimes we don’t quite know the steps, or get out of sync with one another. I step on the land’s toes (leaving the barn door open and then trapping a phoebe by mistake in the upstairs) and it steps on mine (letting the late blight blow in two years ago). But I’m figuring it out, how to be a good, though not perfect, partner. I’m looking forward to this season’s adventures, the new dance moves–I’ll be practicing my stay-out-of-the-house shuffle for sure.